The last blog post in the Magento Integration talks about the benefits of integrating your Magento e-commerce store with your POS to boost efficiency and improve the shopping and purchasing experiences of your customers. Most retail establishments utilize cash registers, cred card scanners, iPads, peripherals and a variety of software applications to facilitate a transaction. Whether this is a static point or a mobile one, Point of Sales (POS) is where retailers verify product information and costs, boost revenue by providing additional warranties or services, and link backend operations. The POS is also a critical point of value for the customer who may evaluate their shopping and purchasing experience through their checkout experience. For its security, financial and brand loyalty importance, the Point of Sales is an immensely important process that requires integration with major operational platforms including your ecommerce portals using Magento. Microsoft Dynamics RMS—This comprehensive POS system offers a variety of automation, streamlined transaction, reporting, and scalability options for small and midsize companies. Microsoft Dynamics RMS integration with Magento can provide added enterprise responsiveness and efficiency which can lower costs and enhance consumer shopping experiences. For more information on our integration solution for Magento and Microsoft Dynamics RMS, click here. Light Speed —This popular static and mobile POS system is a next generation system which utilizes the power and ease of use of Apple products like the iPad within a robust and richly featured retail system. Light Speed has solutions for POS, customer management and inventory management. Light Speed integration with Magento allows retailers of virtually any size to have a real time overview across in-store and ecommerce outlets. Retail Pro—Retail Pro is one of the most trusted POS solutions on the market. This application can monitor inventory and SKU tracking as well as accurately measure retail performance. One of the key benefits of utilizing Retail Pro is that it has a fully developed network of dealers and partners. Integrating Retail Pro with your Magento storefront can heighten your company’s ability identify weaknesses in your retail strategy, thus driving greater revenue production. These popular POS systems may provide some of the features that your retail organization requires, but they are only capable of realizing their full potential when these POS systems are properly integrated with your Magento ecommerce sites. Without proper integration, you may be juggling information in two or more systems which lowers enterprise efficiency, increases risk and incompatibility, and diminishes the customer purchasing experience. Key information about customers, inventory or purchases can be lost or erroneous which translates into lost sales and weakened brand strength. Our team at i95Dev has recognized the need that retailers have for a seamless integration solution, and we have developed an industry-leading application to join your POS system with your Magento based online store. Multi-Store: The integration solution that i95Dev provides allows your POS system to integrate data with your Magento applications so that all sales, inventory and customer information can be shared across your organizational silos. Multi-Channel: Integration of POS with Magento enhances visibility of operations on other channels like Amazon and eBay. Our integration solution ensures that your products on these partner sites are linked to the latest pricing, availability and shipping information available to your company. Customer Management: There are few processes in a retail organization that are as costly in terms of time and personnel investment as POS. With the proper integration, your business can improve the operational efficiency at POS stations by providing customer information at a single command. This immediate responsiveness allows your customer representatives to more quickly process a transaction, fulfill an order, process a back order and offer lucrative purchasing options like warranties or customer rewards. Product Management: The integration solution offered by i95Dev allows your tellers to access the most current product information available including name, description, images, product SKU, prices, and product variants. With the proper POS integration with Magento, this information is made available to your POS stations as soon as it is entered on your enterprise network. Inventory Management: POS integration with Magento is especially important to maintaining the most accurate inventory data across channels and transaction portals. As soon as a purchase is made or your supplier’s shipment arrives, all of your in-store and online portals will update their availability, product variant and pricing information. 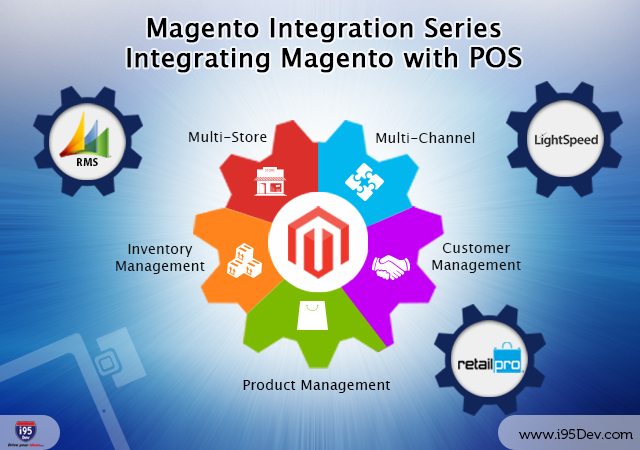 i95Dev offers complete solutions for integrating the most popular POS systems with Magento eCommerce. Our powerful integration solutions will save your business time and effort, drive revenue growth across the globe, boost efficiency and improve the shopping and purchasing experiences of your customers. Contact us today, to learn how i95Dev can make your retail business an industry leader.